- Select Function: 8310, 8310 DSS, 8310 SCS, or 8310 DSS/SCS. - Delivery: The RCI 8310-28, 8310 SCS-28 & 8310 DSS/SCS-28 are In Stock. Please allow 3-5 days' lead time on all other functions. Models 8310 and 8320 are extremely popular with installers and end users alike, due to their "hands-free" mounting design, plug-in wiring terminals, built-in time delay, low-voltage detection, reliable holding strenght and optional features. - Larger (Right Angled) LED size for better visibility (SCS versions only). - Built-in time delay (instant release with adjustable relock, programmable from 0-110 seconds). - Field selectable voltage - 12/24VDC. - Convenient plug-in wiring terminals. Door Status Sensor (DSS): A DSS is a contact type sensor switch used to monitor the position of a door independent of local power. It is a means of remotely indicating whether the door is open or closed, but not necessarily locked. Ideal for anti-follow through on access contorl systems; Remote Door Hold Open applications, and CCTV activation. 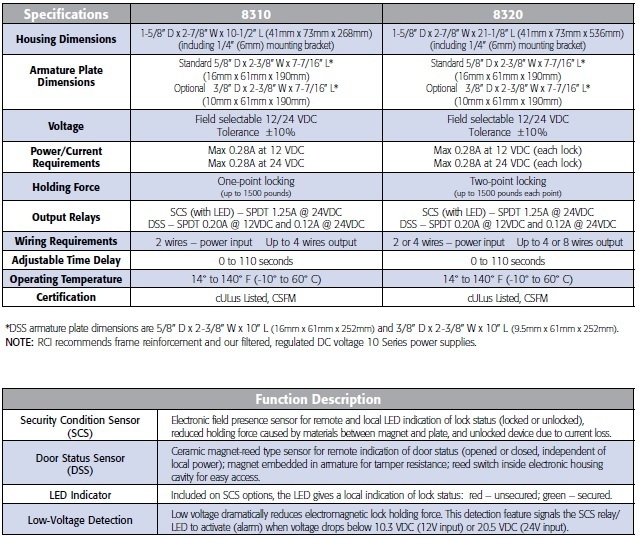 Security Condition Sensor (SCS): An SCS is a solid state bond sensor that operates an LED and an SPDT relay to indicate either low voltage or tampering of the lock. The SCS indicates lock status (locked or unlocked). The sensor will initiate an LED to inform locally or report remotely of reduced holding force due to the presence of materials between the magnet and armature plate, an unlocked status due to current loss by severed wires or other means. Ideal for Remote Door Hold Open applications, CCCTV activation, traffic control applications, etc. Security condition data can be sent to a remote device, trigger an audible alarm (on the device or on the remote device), trigger a visual alarm (on the device or on the remote device), or a combination of these. The SCS sensor is highly sensitive and is recommended for high security applications. Delivery: The RCI 8310-28, 8310 SCS-28 & 8310 DSS/SCS-28 are in stock and available to ship. Please allow 3-5 business day lead time on other functions.